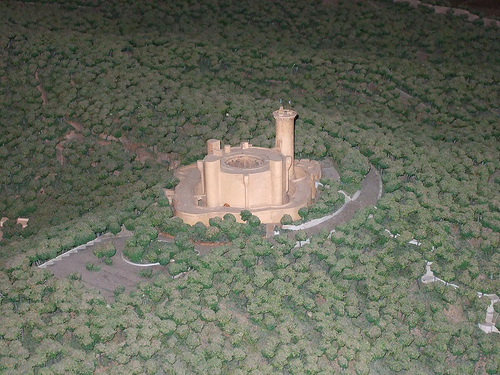 The Bellver Castle in Palma de Mallorca is the only circular style castle in Spain. After a mid-week round of fixtures, there is no rest for the weary as another slate of weekend matches comes much more quickly than they would earlier in the year. This last quarter of the year becomes a war of attrition, and those who consistently stay fit will reap the benefits as they take advantage of those squads that cannot keep their core players on the pitch. Mallorca’s latest foe to challenge their home superiority comes in the form of FC Barcelona. Los Barralets will not fear their closest neighbors, as the Blaugrana stands between them and three vital points in the islanders’ aspirations for European football. Pep Guardiola will not let his team wander their minds toward its trip to London to face Arsenal in the Champions League on Wednesday. Again in the position to post their results before Real Madrid, Barça will want to add more pressure to Los Blancos when Real Madrid plays in the late Sunday kickoff. In that late Sunday kickoff, Real Madrid will host Atlético Madrid in El Derbi madrileño. Recently, the rivalry has been in name only, as Atlético Madrid has not defeated Real Madrid in over ten years. In one of those statistical oddities, since Los Colchoneros returned to the top flight in 2002, they forced a draw at the Santiago Bernabéu in every other year. If the pattern persists, then Atlético should lose on Sunday, but this Atleti team has defied any logical reasoning or explanation this season. While Atlético Madrid also has a Europa League match against Valencia on Thursday, they will not look ahead to that match when the preceding game is against their eternal enemies. If they were facing a Real Valladolid or some other team at the bottom end of the table, Atlético Madrid would have likely waned in their concentration, but the double incentive of defeating their arch rivals as well as knocking them from the top of the table will give them an extra impetus to be the only team to conquer both Barcelona and Real Madrid this season. At the other end of the league, Xerez invites Real Valladolid to El Chapín in a pivotal relegation six-pointer. Valladolid has only won once in 2010, but that win came two weeks ago against Deportivo La Coruña. With their 0-0 draw against Espanyol on Wednesday night, Valladolid currently rides a two-match unbeaten streak, a significant event for this team. Only two points from safety, La Pucela could salvage a putrid season by starting with a triumph over Xerez. Xerez has earned eight points in their last five matches, only three less than they gathered in their first twenty-three games. Momo and Mario Bermejo, who scored twenty-nine goals between them in the Segunda División last season, are finally delivering the goals for Xerez in the top-flight, and their goalkeeper Renan, who is on loan from Valencia, has kept them from conceding many more goals. Seven points behind Real Zaragoza for relegation survival with ten matches remaining is not the largest hill to climb, and while Xerez does not control their own destiny, the execrable play of the clubs ahead of them gives Xerez more than a strand of hope of pulling off the impossible. Unfortunately, the Málaga – Tenerife matchup at La Romareda will not be shown on US TV. Barcelona and Arsenal were drawn to face each other in the quarterfinals of the Champions League, and this rematch of the 2006 Champions League final pits two teams that thrive on maintaining possession and forcing their opposition to chase them around for the whole match. The interesting question will be which team will hold the majority of possession and what that ratio will be. If Barcelona has any weakness, they sometimes have trouble breaking down highly organized and disciplined defenses, e.g., Rubin Kazan, Chelsea, and Osasuna. Arsenal’s defensive philosophy definitely does not fall into that category. Arsenal expects to hold the edge in possession in every match they play, but chances are that Barça will win that battle. If Arsenal can adjust to this and work more on the counter-attack, even at the Emirates Stadium on Wednesday, the north London club has a great opportunity to knock out the current European champions, but if Arsène Wenger sticks to his philosophy and tries to out-Barça Barcelona, expect a two-legged rout. With three different countries each having two teams in the final eight of the Europa League, there was a better than fifty percent chance that a matchup between two teams from the same country would occur. While the two English and two German teams avoided each other in the quarterfinal, there will be an all-Spanish affair in one of the quarterfinals between Atlético Madrid and Valencia. Both coaches lamented facing each other at this stage of the tournament, but Unai Emery and Quique Sánchez Flores agreed that this meeting benefited La Liga because there will definitely be one Spanish team in the semifinals. Valencia has been the more consistent team all year, and they have David Villa leading the line, the best and most dangerous player between the two teams. In their two meetings in La Liga, however, Atlético Madrid had the upper hand. In the first match, Valencia gave up a stoppage time equalizer to Maxi Rodríguez, and Los Colchoneros earned a point at the Mestalla. In the second meeting, Atleti thrashed Los Che 4-1, which included a straight red card for Carlos Marchena because he imitated his of goalkeeper César Sanchez by slapping the ball away from Sergio Kun Agüero in the penalty box. The edge in this matchup actually goes to Atlético Madrid because of their cup pedigree this year. They have made the final of the Copa del Rey along with reaching the quarterfinals of the Europa League, and they seem to focus and play better when they face tougher competition. Against the likes of Málaga, Almería, and other teams at the bottom half of La Liga, Atlético almost acts as though those matches are not important enough to give their full effort. Against an upper echelon team like Valencia in a knockout situation, Los Rojiblancos will likely rise to the occasion, and Valencia needs to match this intensity if they want to reach the semifinals of the Europa League. According to my sources, the Real Madrid – Barcelona match will be the late Saturday kickoff on April 10 at 4:00 PM EDT, 10:00 PM local time in Madrid. Gol TV will have a pre-game show at 3:00 PM for an hour until the match commences, and after the final whistle, Gol TV will host a one hour post-game show. No word yet from ESPN about their coverage of the match, but my guess is it will be similar to the first Clasico, where ESPN 360 will have English-speaking announcers (most likely Adrian Healey and Robbie Mustoe) and ESPN Deportes will have Spanish-speaking announcers (most likely Fernando Palomo, Mario Kempes, and Martin Ainstein). Thanks for quick response. Hopefully your sources are correct and the blaugrana defeat evil lol.